Piqua, Ohio, June 5, 2017 – Hartzell Propeller has delivered more than 50 new Top Prop five-blade composite swept tip props for the Pilatus PC-12 fleet since introduction 18 months ago. 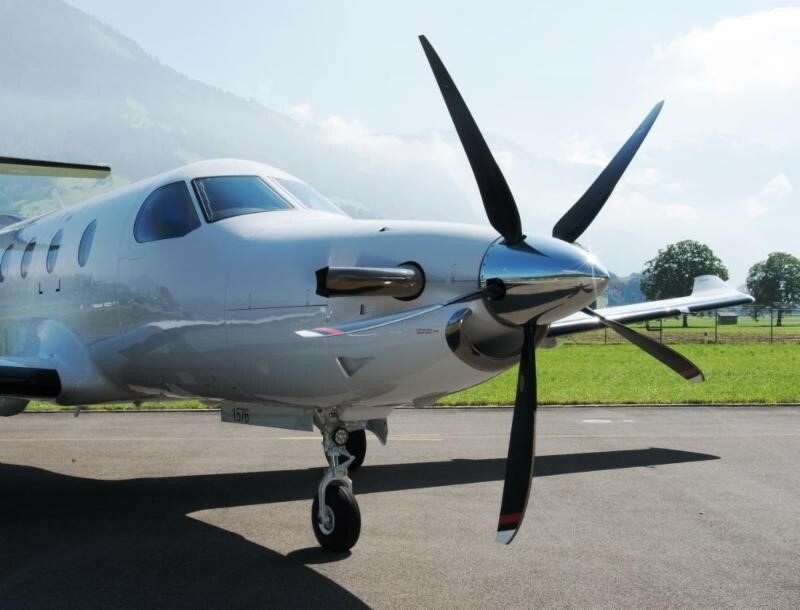 In addition, Hartzell has delivered more than 160 of the new propellers to Pilatus for new PC-12NG aircraft over that time period, bringing to more than 200 the total PC-12s flying with Hartzell’s new five-blade propellers. New Pilatus PC-12 NG aircraft feature the specially designed five-blade, 105-inch diameter composite propeller as standard equipment. The propellers are available under Hartzell Top Prop program for the Pilatus PC-12 fleet, which totals more than 1,400 business aircraft. Hartzell will have technical experts on hand to discuss the propeller at the upcoming Pilatus Owners and Pilots Association (POPA) Annual Convention June 8-10 in Coeur d’Alene, Idaho at The Coeur’ d’Alene Golf and Spa Resort. The new structural composite five-blade propeller is lighter than alternative wood core five-blade propellers and seven pounds lighter than a four-blade aluminum propeller. The PC-12 NG cruises five kts faster with the five-blade Hartzell propeller and it climbs to a cruise altitude of 28,000 ft 10 percent quicker and has a 50-foot reduction in total takeoff distance. Its highly swept airfoil reduces flyover and cabin noise and its blades are certified for unlimited life. “The Pilatus PC-12 with Hartzell’s aerodynamic five-blade prop gives owners and operators excellent performance and reliability,” said Hartzell Propeller Executive Vice President JJ Frigge. He added that Hartzell offers the new composite five-blade Pilatus prop with its industry leading Top Prop warranty through first overhaul (6 years or 4,000 hours). Hartzell’s Structural composite propeller utilizes aerospace grade carbon fiber and is five to 10 times stronger than beech and spruce wood core propellers. Stronger materials permit thinner, wider airfoils that optimize performance. The propeller’s state of the art wedge shank retention system made of stainless steel alloy is more robust than alternative lag bolt and aluminum construction. Further, it has a nickel cobalt leading edge with a stainless steel mesh erosion screen for unmatched durability and FOD protection.